Born in 1974 to Turkish and English parents in London, MUZZY IZZET was a player who crossed the footballing divide. From an old school YTS upbringing and a prevalent hard drinking culture to the 21st century youth academies and a game awash with money, with the temptations afforded by greater celebrity and the perils of social media. 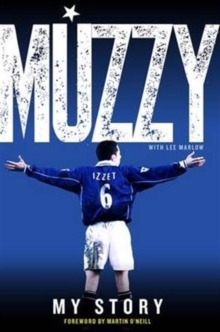 Brought up at a pre-Roman Abramovich Chelsea, Muzzy's was a harsh awakening to the reality of football, a future that might have been so different had a secret contract not have saved him from a possible footballing scrapheap. Run-ins with future England boss Glenn Hoddle followed, before an unfashionable East Midlands club took a chance on the raw midfielder. Managed by the enigmatic Martin O'Neill - the current Republic of Ireland manager has also penned the foreword - Leicester City sneaked into the play-offs from which they rose, to the Premier League. Muzzy never looked back. He became a Foxes legend, playing with and against some of the greatest players in the Premier League era, making over 300 appearances and winning two League Cups in the greatest period in the club's history - although there were also lows, as he recounts...A chance celebration with the flag of his father also became the starting point for an eventful international career with Turkey, playing at Euro 2000 and the 2002 World Cup where he lined up against eventual world champions Brazil in the semi-final. In 2004, he moved on to Steve Bruce's Birmingham City, where a horrific knee injury would bring an end to his career at the age of 31, robbing him of the chance of a dream end as a player, back home...With the Leicester Mercury's award-winning feature writer Lee Marlow, Muzzy gives a searingly honest account of the highs and lows of life on and off the pitch, the tales from the dressing room, the characters and the controversies from one of the most eventful periods in the game.